Villa Verde is one of three villas situated at Quintinha au Sol, TV's 'My Place in the Sun'. They are newly built and privately owned. Quintinha au Sol is a small rural property located in Gaula which is about 300 metres directly above Santa Cruz and less than 10 minutes from the airport. There are spectacular views over the bay of Abra, towards the Deserta Islands and to Ponto Sao Lorenço, the eastern tip of Madeira. At the same time Gaula is only twenty minutes from the centre of Funchal. The villa is ideally situated for walkers and golfers - the Gaula levada, which is at the eastern end of the 'Levada dos Tornos', is less than 5 kilometres away and the two internationally famous golf courses, Palheiro and Santa da Serra, are both less than15 minutes by car. With large balconies, terraced areas and mature gardens surrounding the villa, there is ample choice of seating and relaxing areas.............ideal for al fresco dreaming, drinking and dining! Nice house, clean and well-appointed. Could not use the pool because full of bird poop and feathers (cleaned maybe once a week and filter not effective). Thank you for the compliments on the house. However you are mistaken about the pool! It is at a different level, so perhaps you didn't go close enough? As soon as we read your review we checked with the pool man and he showed us what you thought were bird feathers. These were in fact airborne seeds from the wild flowers around the villa. They were large and could be mistaken for feathers. As for the bird "poo" this was a couple of dead leaves that had sunk to the bottom. The filter is carefully maintained, and yes, the pool man attends on a weekly basis (all year round). However, should anything be reported to be amiss, Carlos is more than happy to call back and attend to it. Had you contacted us we could have arranged an extra visit, and he would have explained what you were actually looking at. Instead you said nothing and waited until your return to post a partially critical review! Great accommodation, beautifully situated and the owners were fantastic! Good to hear such positive feedback - thank you. Villa Verde had excellent facilities, genial and helpful hosts. The location is hidden and up several steep hills, but follow the directions given by the owners and you will find the villa. The trip up the hills is worth it as views are breath taking from the property. Although we did not spot any whales in the bay we did see many swifts, gisnt orange butterflies and lizards! The pool is very well maintained and we enjoyed daily swims. We would definitely recommend Villa Verde! Thank you for your recommendation. The views are amazing! Pleased our directions work - we sometimes have problems dissuading people from using SatNav. A very enjoyable family holiday. The accomodation was excellent - spacious, clean and comfortable. Maria, the housekeeper, and her husband were more than helpful. We are delighted that enjoyed your stay. Maria always makes an effort! Can only say good things clean well kept great views friendly and helpful support staff just a few mins to airport or Funchal but quiet location high up from main roads.nice touch welcoming bottle of madiera wine. Would certainly recommend it to friends family island is wonderful,the capital is amazing and scenery stunning. only in Bavaria have I seen such overall cleanliness with every one seeming to take great pride in their houses gardens and island. The whole island is easy to get to though car rental is mandatory to really see the whole island. Too bad pool isn't heated so wasnt warm. Enough at this time of year to use.would I stay there again certainly without a doubt. It would be a different price with a heated pool unfortunately! Some are hardy enough to swim all year round, and our pool-man maintains it 52 weeks a year round. Otherwise pleased you enjoyed your stay. Lovely place! We stayed with or children. The house was very well catered and the view was great! Delighted you enjoyed your stay. The views are memorable - everybody says that! 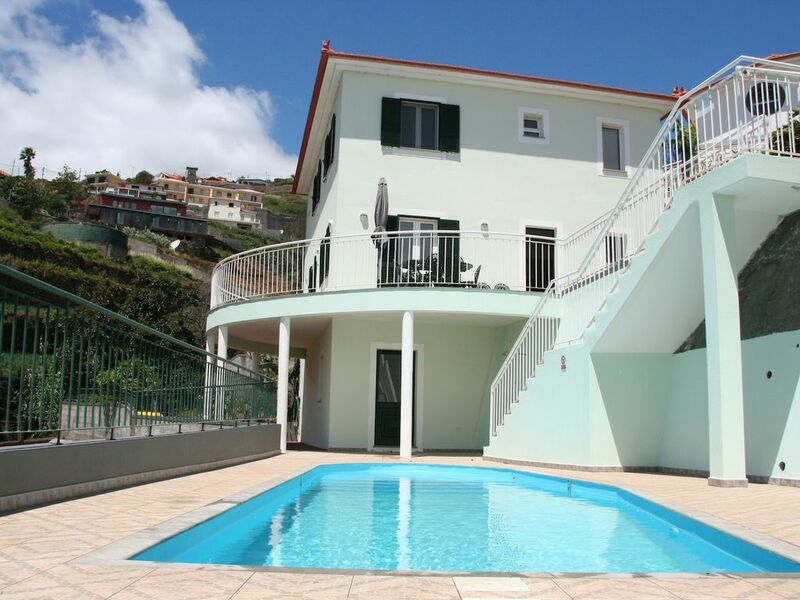 A considerable amount of investment has recently been made in the sea-front areas in Machico (15 mins by car), Santa Cruz (7 mins by car), Canical (20 mins by car) and Canico de Baixo (10 mins by car). All provide excellent swimming and sea front facilities for holiday makers; throughout the winter, the sea temperatures (18-22 degrees) are often 2-4 degrees higher than the air temperature. Costs for refreshments and lunch at these centres, are very reasonable by European standards, even in Funchal a lunch (dish of the day and pudding with a glass of wine and a coffee) can be had for €5.50. A 30 minute coast walk can be enjoyed at Santa Cruz where there is also an impressive modern aquaparque near Sao Pedro. If you enjoy walking, you will be spellbound by the unique experience of the famous Levada walks, a number of which can be found in the area. There are excellent walking alternatives on this enchanting island - most are accompanied by a vital element; water, and an ancient Forest which has survived from the tertiary era; the Laurissilva Forest (UNESCO World Heritage site). These factors make walking on Madeira island totally unique and the hillsides in this locality are an excellent place to start.